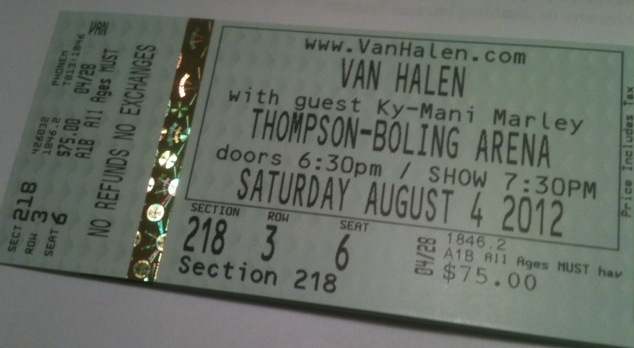 Van Halen originally included a Knoxville date in their 2012 American tour, but it was one of the concerts they cancelled due to “exhaustion,” which seemed to be a euphemism for “wanting to go to Europe instead.” I was even supposed to go to that show, but now I’ll probably never get to see the original line-up, including Diamond Dave himself. John Scanlan’s 2012 book about the band makes me even more sorry that I didn’t get to see David Lee Roth in person, as Scanlan presents him as a Zen master — or is it a Taoist sage? Reaktion Books published Van Halen: Exuberant California, Zen Rock’n’roll in its Reverb series, which “looks at the connections between music, artists, and performers, musical cultures, and places. It explores how our cultural and historical understandings of times and places may help us to appreciate a wide variety of music, and vice versa.” Scanlan, a sociologist at Manchester Metropolitan University, claims that Van Halen represented 1970s California culture, and that the band — or at least the David Lee Roth part of it — embodied a kind of Zen spontaneity and playfulness. What I found frustrating in this chapter was the ambiguity of whether Roth himself identified with Zen, or whether it was Scanlan who made this identification. The latter seems more likely, but Scanlan reports that Roth used a Zen parable about drawing a leaf to explain Van Halen’s work in an interview with the Los Angeles Times. I was initially intrigued by this book’s title, and I was curious to see how Scanlan would locate Van Halen in the context of California Zen. It’s pretty easy to make the case for a distinctive form of “California Zen” in the writings of Beat authors living in California for significant periods (Gary Snyder, Jack Kerouac, Allen Ginsberg), institutions such as the San Francisco Zen Center, or the perceived connections between California culture and Zen values. It takes a lot more work to connect these ideas to Van Halen. I don’t think Scanlan makes a strong enough connection between California Zen and David Lee Roth or Van Halen as a whole to justify framing the book in these terms. A more compelling comparison Scanlan might have made to illustrate DLR’s Zen character is to the Japanese Zen monk Ikkyu (1394-1481), known for his fondness of alcohol and female companionship. Ikkyu even celebrated his transgressions in verse. However, an important distinction is that Ikkyu was an ordained Zen monk and went on to become abbot of one of the biggest Zen temples in Japan. This kind of specificity would help Scanlan’s case, but the images of Zen (and California) that Scanlan uses in this book are too impressionistic and vague to prompt interesting insights into Van Halen’s connections to musical cultures and places. Van Halen: Exuberant California, Zen Rock’n’roll is a good history of the band, though it doesn’t appear to use new material. What it tries to offer are new lenses through which to understand how Van Halen emerged from a particular place at a particular time. The problem is that both of these lenses — California and Zen — are too blurry to show clearly why Van Halen embodies exuberant California, Zen rock’n’roll.